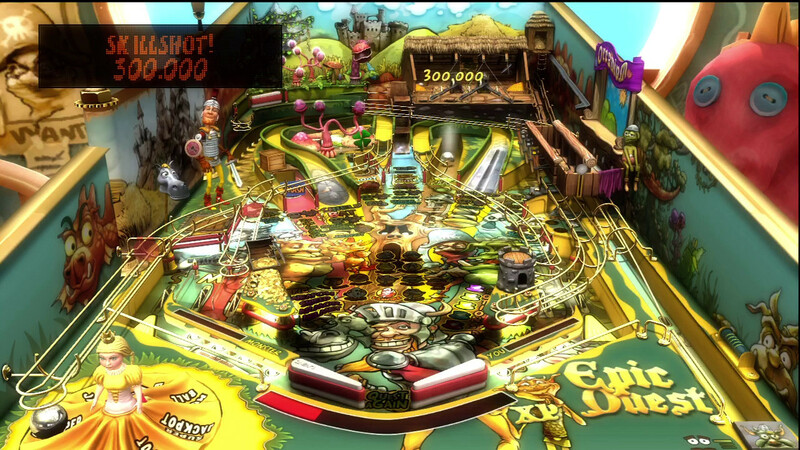 Our friends at Zen Studios, the busy little worker elves that they are, have produced yet another table for their prolific Pinball FX 2 platform. 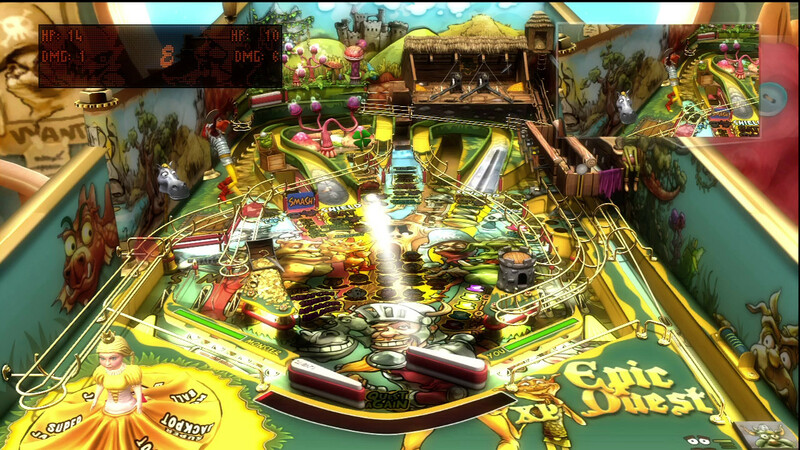 This time we’re looking at a departure from their licensed tables, a pinball RPG hybrid called Epic Quest. Zen Studios has maintained their usual high level of quality. Whereas most of their tables combine photo-realistic elements with well-sculpted characters, this table stirs things up a bit. Realism is swapped out for style, for one thing. The whole table is sort of a cross between a medieval countryside and a classical theater. Along one side is a stage, where our hero Max struts his stuff and goes through the motions. 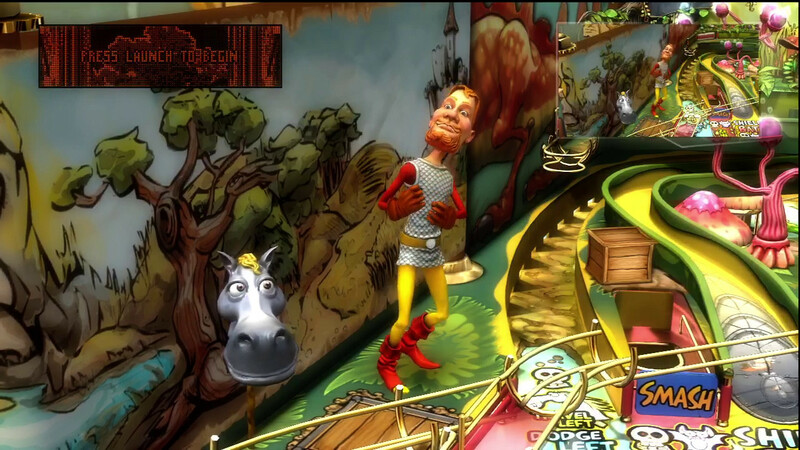 On the other, a puppet show-style theater shows off the mini-plot of various encounters. In the fleeting glimpses you can spare toward Max himself, they’ve given him animations appropriate to practically every event that happens on the table. You’ll see him do matrix dodges, chug potions, open chests, and ride his fake horse in response to the motions of the silver ball. 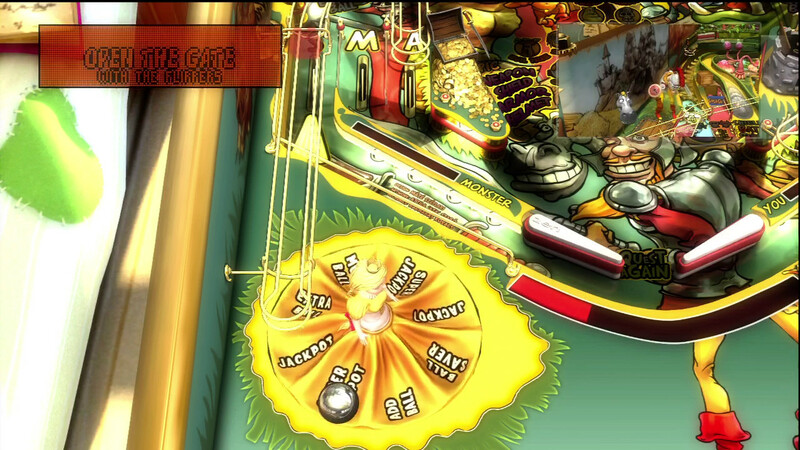 Once again, we all know how pinball is played, and this being Pinball FX 2, it continues to be as faithful and engaging as the real thing. 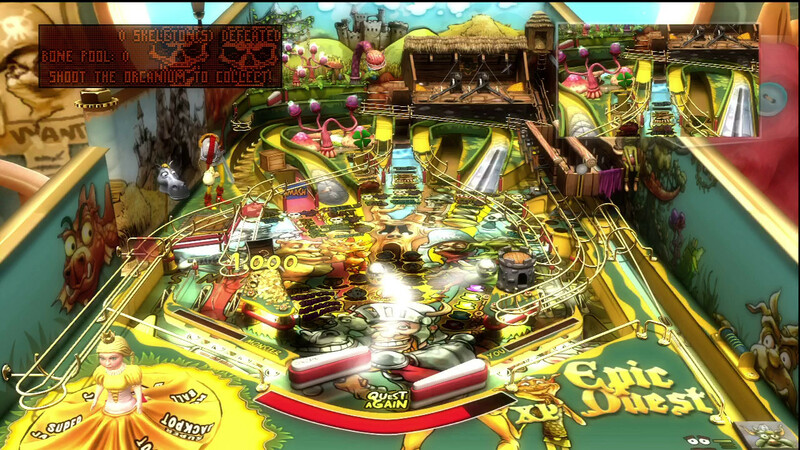 What sets this table apart is the inception-style game within a game. You see, this table is essentially a parody of RPGs, and sure enough, various interactions with the board bring about some of the standard RPG encounters, including the ever-popular flock of bats and the mysteriously common skeletons. 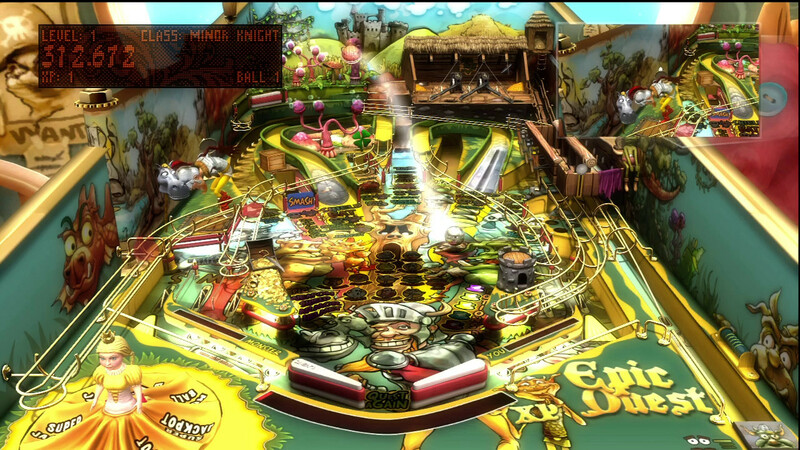 These are played off in a manner similar to any other miniature bonus round, with flashing bat-lights indicating the appropriate places to hit the ball, and each time you send the ball down the appropriate path a kill is tallied. I'd feel better about skeletons always being evil in these games if I didn't have one inside of me right now. Things get more unique when you start a full-scale encounter. You find yourself facing off against a monster, complete with attack stats, health, and experience value. Now the ramps previously responsible for earning points take the place of the action menu in an old turn-based RPG. The sword ramp and smash targets attack, shield ramp blocks. 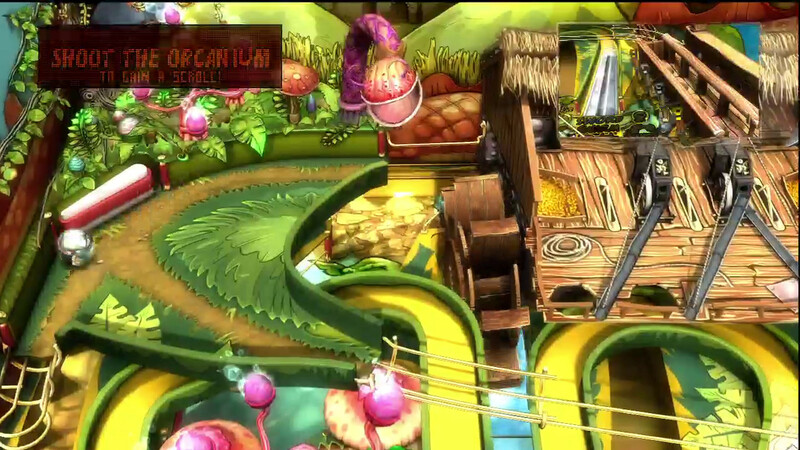 There are slots and ramps representing dodge, potion, spell. 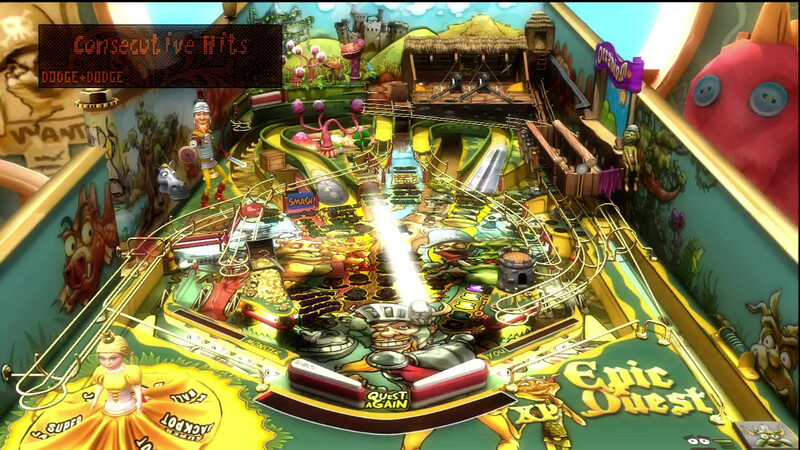 Hitting different ramps in rapid succession will combine actions into combos. 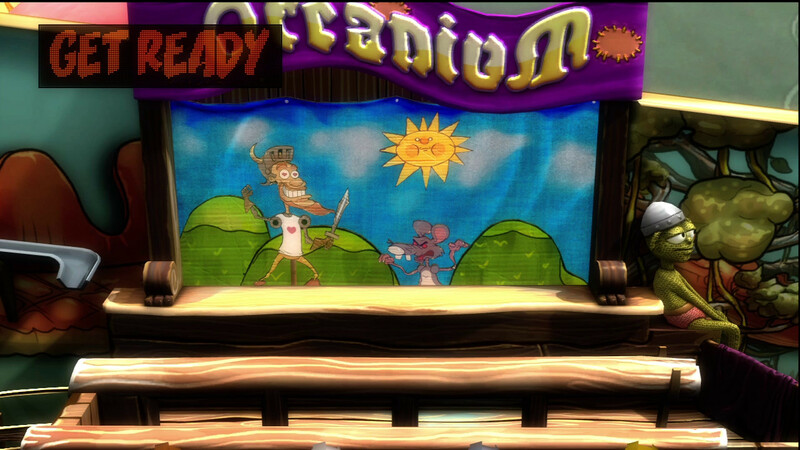 Hitting bumpers will increase the action clock to allow you further attempts at attacks. Killing the foe doesn’t just earn you points, either. 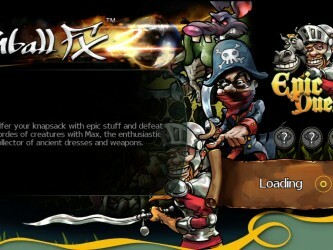 It earns you XP, which allows you to level up, increasing HP and whatnot in the RPG aspect and point totals in the Pinball aspect. Name a typical RPG feature and it shows up in some way, shape, or form. 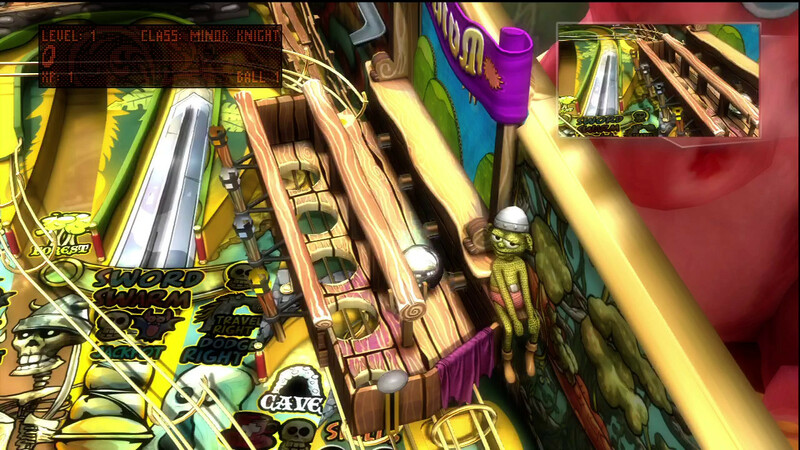 I’ve played a game or two that claims to combine RPG and Pinball. 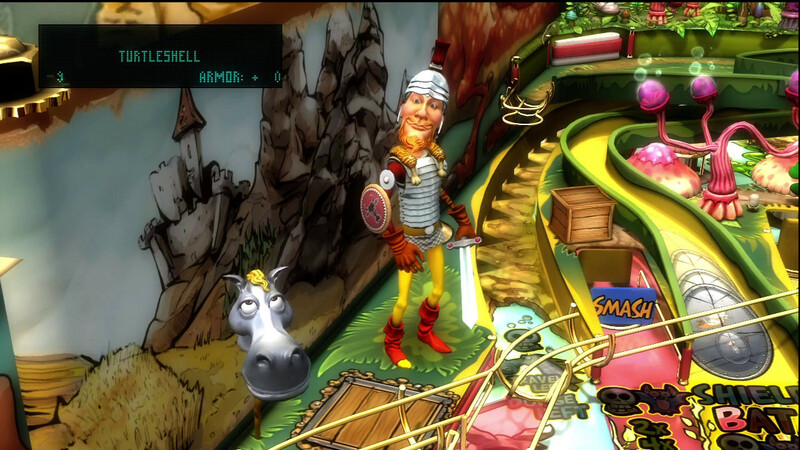 Epic Quest feels like you are using pinball to play an RPG, and it is surprising how well it works. While the music is the standard generic minstrel and fanfare-style stuff you’re used to in an RPG, the real star of the audio is Max, the hero. The voice work is reminiscent of an updated version of Dudley Do Right. He takes a lot of pages out of the standard “hip and modern, anachronistic character” playbook. (Think Genie from Disney’s Aladdin.) His quips are pretty funny, though, and as far as I’m concerned the pop culture references are surprisingly clever and obscure. “This is bat country… Let’s stop here!” is a line I particularly enjoyed. Our "Hero", ladies and gentlemen. The story of the table is roughly the same as every early RPG ever, which is part of the whole ‘parody’ aspect of the table. You are a knight. Your goal is to rescue a damsel and defeat the forces of evil. The twist, though, is that your goal is ALSO to get rich. You are unapologetically seeking loot, and your primary motivation seems to lean fairly heavily in the direction of accumulating valuables. Sure, you’re still eager to conquer evil, but why let that pile of gold that the giant rat is inexplicably toting around go to waste? 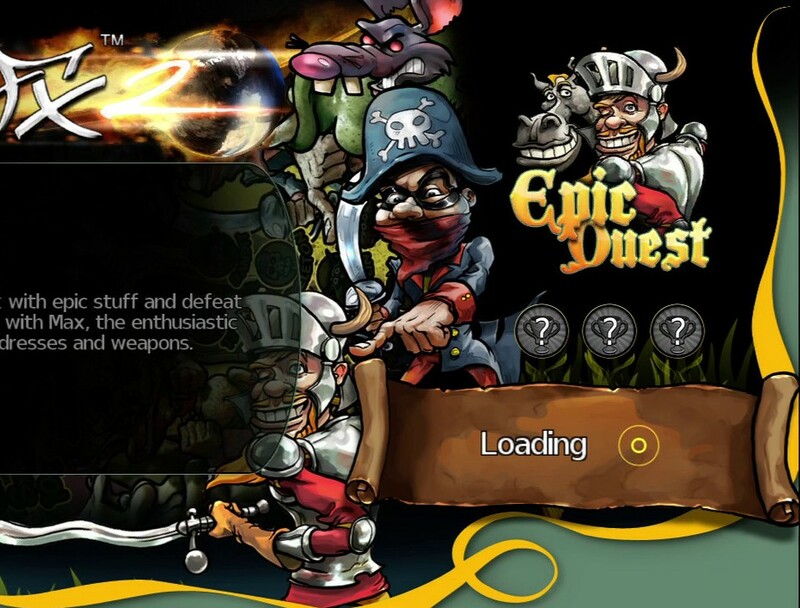 Much in the same way that Puzzle Quest enabled you to play an RPG by playing Bejeweled, Epic Quest allows you to play an RPG by playing pinball. 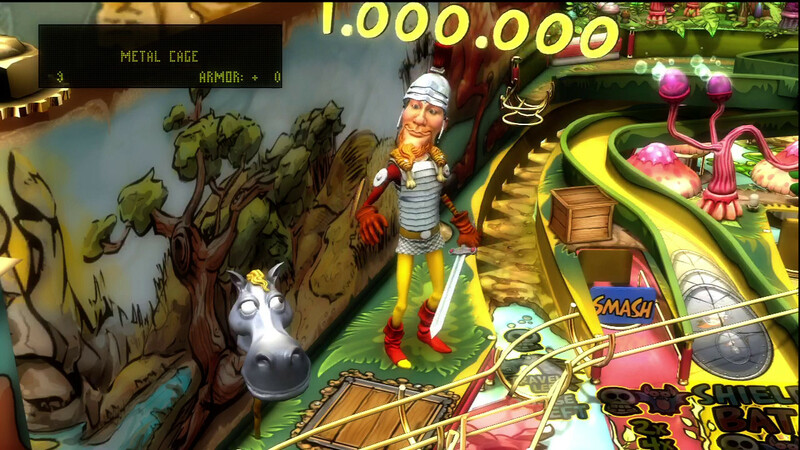 It is a well executed concept that only further reinforces my wish that I was any good at pinball so that I could level-grind Sir Max the way I would in the RPGs of old. 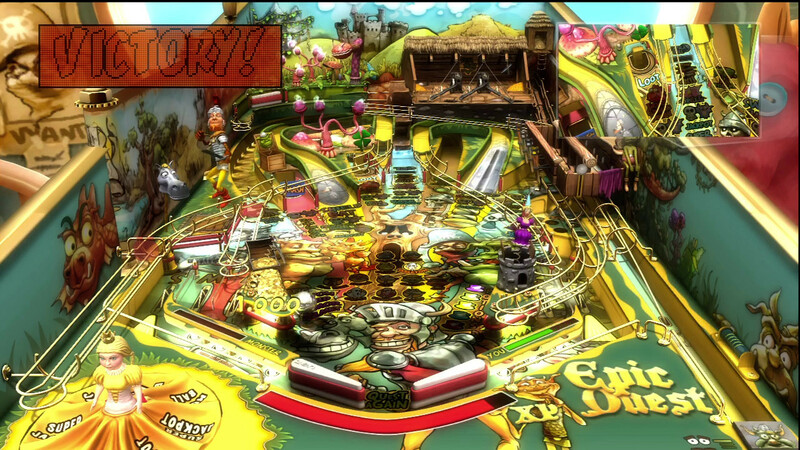 8.2 / 10: Building on an already rock-solid foundation, Epic Quest does a remarkable job crossbreeding pinball with an RPG. Our “Hero”, ladies and gentlemen. I’d feel better about skeletons always being evil in these games if I didn’t have one inside of me right now.